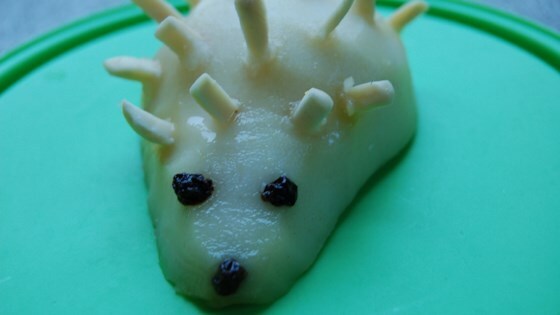 "A cute little snack for a kid's birthday or in the afternoon during a play date. I feel whenever I present my kids food in a fun and cute way, they eat whatever I give them." Stick slivered almonds all over pear halves so they resemble spikes, leaving the pointy side of the pear empty for the face. Stick 2 raisins in the face part for eyes and one on the front for the nose. You can also use fresh pears instead of canned.